Vereinigte Staaten von Nord-America und Mexico. 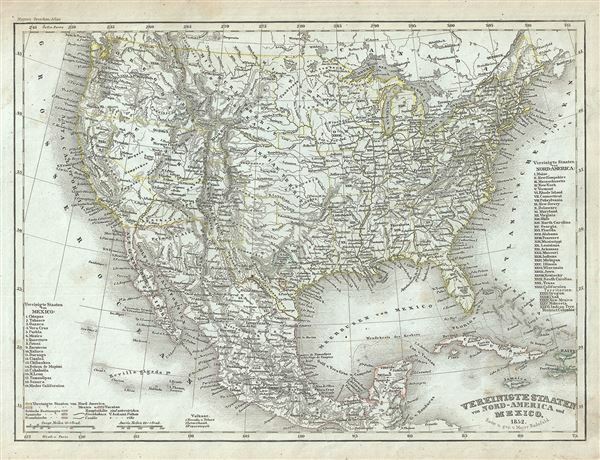 This is a scarce 1852 map of the United States and Mexico by Joseph Meyer. Depicts the United States at the height of the California Gold Rush and shortly after the annexation of Texas. The map covers the United States from Coast to coast and shows a very early configuration of the Transmississippi. Nebraska is shown at its fullest, extending from Kansas to the Canadian border. Montana, Wyoming, Idaho, Arizona, Colorado, West Virginia, and Nevada do not yet appear on the map. Shows the Mexico – U.S. Boundary line prior to the Gadsden Purchase. This map was issued at the height of the American westward expansion. Two years before this map was drawn the California gold discovery of 1849 enticed thousands to embark upon the rigorous transcontinental emigration. Meanwhile, with the rise in territorial population to the west of the Mississippi, the eastern states were becoming increasingly divided over the issues of slavery and state vs. federal sovereignty. Within a few years these disputes would lead to the American Civil War. This map was issued in Meyer's Zeitung Atlas. Although all the maps in this atlas are not individually dated, the title page and maps were often updated while the imprint with the date was not, causing confusion to the exact date for some of the maps. Moreover some maps in the atlas were taped in at a later date as an update to the atlas. We have dated the maps in this collection to the best of our ability. Very good. Minor toning and some foxing at places.